“NO” is RJ’s least favorite word . . . and he tries his best to convince his dad, his mom, and his teacher to turn “No” into “Maybe” or “We’ll see” or “Later” or “I’ll think about it.” Even though he doesn’t have much success, RJ keeps arguing until his teacher suggests that he try to join her classroom’s Say YES to NO Club. If RJ can learn how to accept “No” for an answer and to disagree appropriately with his teacher and parents, he can add his name to the club’s Star Board. RJ finds that lots of praise and some rewards come his way when he uses these skills the right way! Help K-6 readers laugh and learn along with RJ as he understands the benefits of demonstrating these social skills both at home and in school. 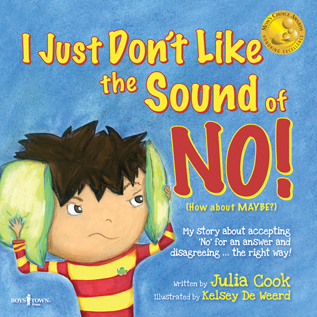 Tips for parents and educators on how to teach and encourage kids to use the skills of accepting “No” for an answer and disagreeing appropriately are included.